The word asphalt is derived from the late Middle English (“asphaltum” and “asphalt”), in turn from French (Late Latin) “asphalte”, which had its roots in ancient Greek. It is a significant fact that asphalt was used by the ancients as both cement for securing or joining together various objects, and as a waterproofing material. Herodotus mentioned that bitumen was brought to Babylon to build its gigantic fortification wall and the Bible mentions its use in securing the bricks during the construction of the tower of Babel. 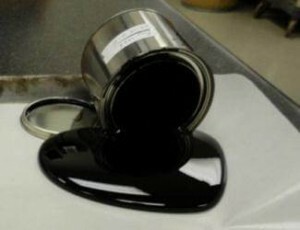 Asphalt is a sticky, black and highly viscous liquid or semi-solid form of petroleum. It may be found in natural deposits or may be a refined product; it is a substance classed as a pitch. Asphalt occurs naturally in a few places in the world, such as in a lake on the island of Trinidad and in the LaBrea “tar pits” in downtown Los Angeles. However most of the asphalt used today for paving comes from petroleum crude oil. Liquid asphalt is the heaviest part of the crude—what’s left after all the volatile, light fractions are distilled off for products such as gasoline. Asphalt/bitumen is sometimes confused with “tar”, which is a similar black, thermoplastic material produced by the destructive distillation of coal. During the early and mid-20th century when town gas was produced, tar was a readily available product and extensively used as the binder for road aggregates. The addition of tar to macadam roads led to the word tarmac, which is now used in common parlance to refer to road-making materials. However, since the 1970s, when natural gas succeeded town gas, asphalt/bitumen has completely overtaken the use of tar in these applications. Other examples of this confusion include the La Brea Tar Pits and the Canadian tar sands. Pitch is another term mistakenly used at times to refer to asphalt/bitumen, as in Pitch Lake. The first use of asphalt/bitumen in the New World was by indigenous peoples. On the west coast, as early as the 13th century, Native Americans collected the naturally occurring asphalt/bitumen that seeped to the surface above underlying petroleum deposits and used it as an adhesive. It is found on many different artifacts of tools and ceremonial items. It was also used as a sealant on baskets to make them watertight for carrying water and to seal the planks on ocean-going canoes. Liquid asphalt is a strong binding agent, readily adhesive, highly waterproof and durable. When mixed with sand and aggregates, the mixture is referred to as asphalt concrete. This mixture imparts controllable flexibility that is crucial in the construction and performance of pavements. 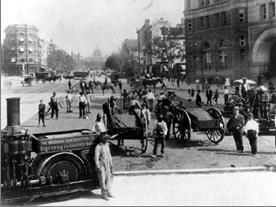 Roads in the US have been paved with materials that include asphalt/bitumen since at least 1870, when a street in front of the Newark, NJ City Hall was paved. In 1875, President Ulysses S. Grant directed that Pennsylvania Avenue in Washington, DC, be paved with Trinidad asphalt (naturally occurring asphalt from the island of Trinidad) in time for the celebration of the national centennial. Three decades later, the road to the Capitol was repaved with new and improved asphalt – made from petroleum. Asphalt binders are most commonly graded by their physical properties and these properties are significantly influenced by temperature. An asphalt binder’s physical properties directly describe how it will perform as a constituent in asphalt concrete (AC) pavement. Although asphalt binder penetration and viscosity grading is still commonly used worldwide, new binder tests and specifications were developed to more accurately characterize asphalt binders for use in AC pavements. The most advanced asphalt binder grading system is Performance Graded (PG) System, which is resulted from the $50 million Strategic Highway Research Program (SHRP) and has been adopted throughout the U.S. The PG grading system is based on the idea that asphalt binder properties should be related to the conditions under which it is used. PG asphalt binders are selected to meet expected climatic conditions as well as aging (time) considerations. Therefore, the PG system uses a common set of tests to measure physical properties of the binder that can be directly related to field performance of the pavement at extreme temperatures. PG grading is based on the idea that an asphalt binder’s properties should be related to the conditions under which it is used. For asphalt binders, this involves expected climatic conditions as well as aging considerations. Therefore, the PG system uses a common battery of tests (as the older penetration and viscosity grading systems do) but specifies that a particular asphalt binder must pass these tests at specific temperatures that are dependent upon the specific climatic conditions in the area of use. Therefore, a binder used in the Sonoran Desert of California/Arizona/Mexico would have different properties than one used in the Alaskan tundra. The PG grading system is based on climate, so the grade notation consists of two portions: high and low pavement service temperature. The major concern for high temperature performance is rutting, which typically takes time to cumulate, therefore an average of 7 day maximum pavement temperature is used for describing the high temperature climate. On the low temperature side, thermal cracking can happen during one really cold night; therefore the minimum pavement temperature is used for describing the low temperature climate. 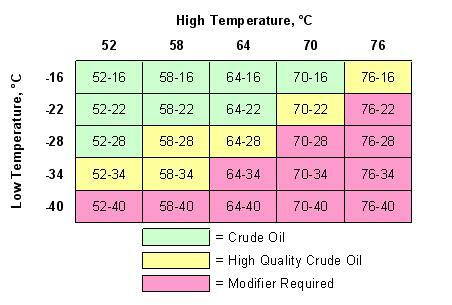 For both high and low temperature grade, PG grades are graded in 6°C increments. The average 7 day maximum pavement temperature typically ranged from 46 to 82°C, and minimum pavement temperature typically ranged from −46°C to −10°C. A binder identified as PG 64-22 must meet performance criteria at an average 7 day maximum pavement temperature of 64°C and also at a minimum pavement temperature of −22°C. Please note that maximum pavement temperature is typically higher than the air temperature by about 20°C since the dark color pavement absorbs the heat and retains it. The maximum pavement temperature is typically measured at about 1 inch below the pavement surface. The minimum pavement temperature occurs on the surface of the pavement and slightly higher than the air temperature (the ground never really gets as cold as the air). The common minimum reliability used is 98%, so that means when the PG 64-22 binder is selected, the asphalt binder in the AC pavement should perform satisfactorily under normal traffic condition at the location where the extreme pavement temperature are within the range of −22°C and 64°C throughout its service life with a minimum 98% confidence level. Where the traffic condition is not typical, such as the really heavy traffic like interstate highway, or slow traffic such as bus stop or intersection area, one or two grades stiffer asphalt binder may be used to help prevent the rutting problem.